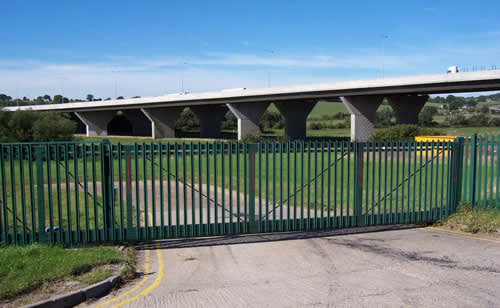 Here you can view some examples of our Commercial Security Fencing & Gates. Both practical and ornate, are designed to maximise security whilst maintaining a pleasing open aspect. Click the thumbnails to see a larger version of the picture. Remember, Enterprise Gates & Railings can taylor a bespoke gateway and railing solution to your exact requirements. Do not hesitate to contact us for your FREE no-obligation quote. Enterprise Gates & Railings electric gate installers UK Gate Automation UK Automatic Gates Installation Timber Gate Fitters and Wrought iron Gate Manufacturers barriers, garage doors, electric gates, automatic gates, entrance systems, CCTV, door entry systems, Automated gates UK, barrier suppliers, gate operators, CAME Blu-partners, wood gates, field gates, metal gates, railings, CCTV, door entry, lamp post, security lighting, security systems, electric gates UK, automatic gates, gate automation, parking barriers, Centurion Automation, CAME electric gates, AESIF Approved installer and Distributor, NIC EIC, NIC Contractor, AESIF Approved, Test and Inspection Certificates, Part P Certification, British Standards, Installers Association, Automated Entrance Systems Installer Federation member, approved member of Automated entrance systems installers federation - Enterprise Gates & Railings Limited Stoke, Electric Gates Stoke, Electric Gates Staffordshire, Electric Gates Stoke UK, Automated gates Stoke UK, Gate Automation Stoke United Kingdom.